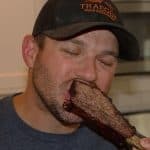 There are a lot of awesome things you can make on a smoker, but some of the best things, are the easiest to make. 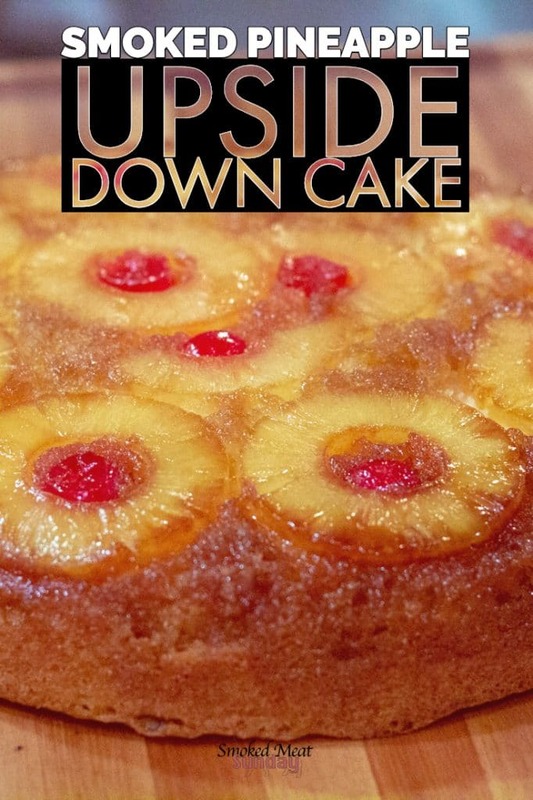 One example is this pineapple upside down cake. 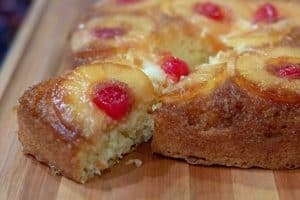 moked Pineapple Upside Down Cake only takes a few minutes to prepare, and it tastes AMAZING. Seriously, I can’t get over how delicious this cake is. I’ve made quite a few different smoked desserts. If I’m in a time crunch, this is ALWAYS my go to. Save this recipe for later! Pin it! Before you get started making this cake, get your smoker setup to cook at 350 degrees. I like to use oak pellets for most of my cooks, but cherry would be great for this recipe too. Pour three tablespoons of melted butter into the bottom of your 12″ skillet, and then sprinkle 1 cup of brown sugar over top of it. 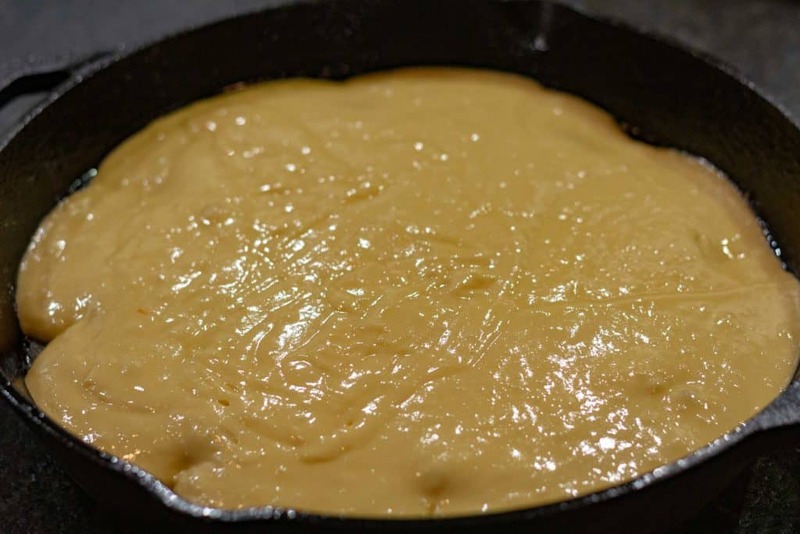 Make sure the butter and brown sugar mixture covers the entire bottom of your cast iron. 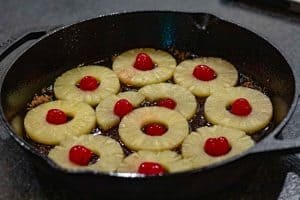 Place pineapple slices on top of the brown sugar mixture, and then place one cherry inside each of the pineapple slices. Don’t discard the pineapple juice! Prepare the cake mix per the instructions on the side of the box, but replace the water with the reserved pineapple juice. (In addition to 1 cup of pineapple juice, you’ll need 3 eggs and 1/3 cup of vegetable oil. Thoroughly mix the batter, and then pour it over the pineapples and cherries. 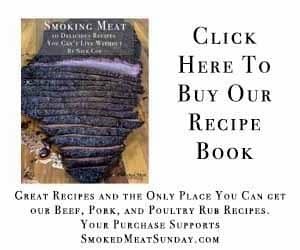 Put the skillet in your hot smoker, and let it cook for about 40 minutes. The cake is done when a toothpick can be inserted in the center and pulls out clean. When the cake is done remove it from the smoker and let it cool for ten minutes. 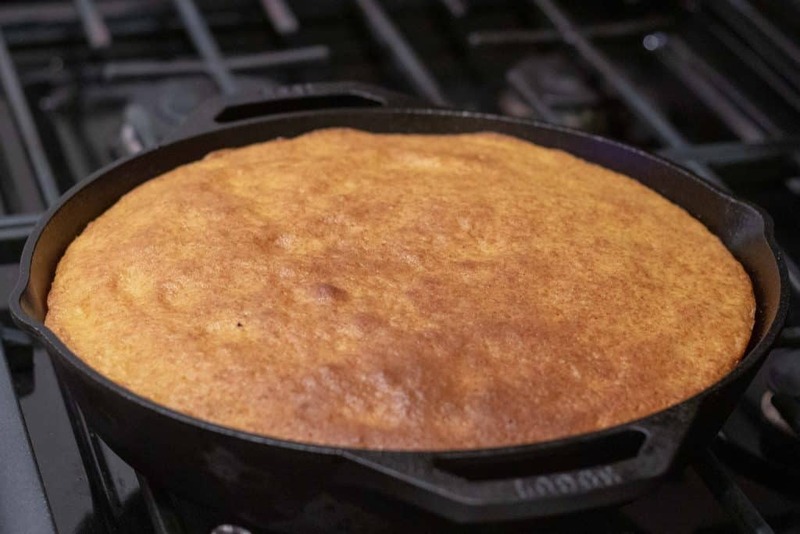 Run a spatula around the outer edge of the cake, and then place a large cutting board on top of the skillet. Carefully flip the skillet and cutting board (to make the skillet upside down!) Tap on the top of the skillet a few times to make sure the cake has come out, and then remove the skillet. Boom. Simple and delicious smoked dessert. 1 box yellow cake mix 9 oz. Prepare the cake mix per the instructions on the side of the box, but replace the water with the reserved pineapple juice. 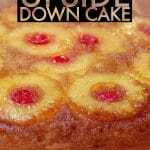 Your Pinapple upside Down Cake recipe is fantastic! For wood I used Grapevine and cherry. AWESOME! Thanks! It’s one of my wife’s faves too. I appreciate the comment!